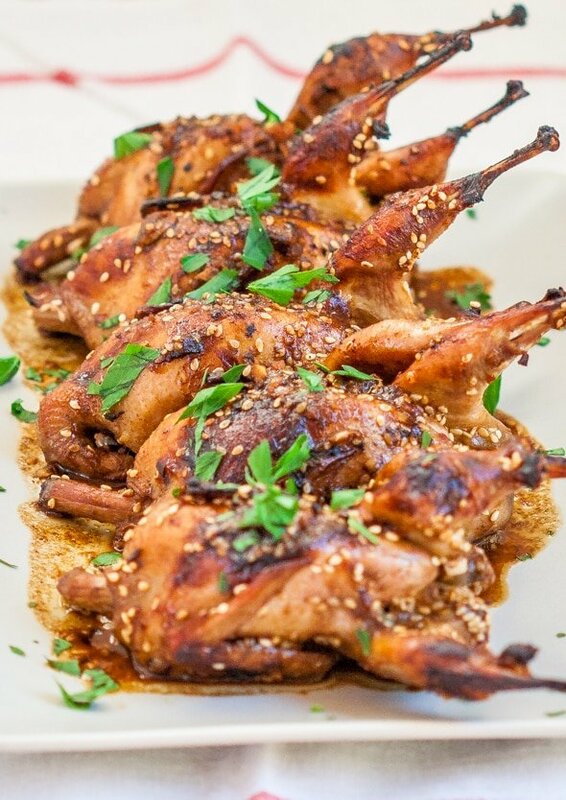 Asian Style Roasted Quail – these quails are full of flavor and spice, simply delicious. If you’ve never had quail before, then this recipe is a must. Have you ever had quail before? If you haven’t, you must try them. First of all, they are so cute and small. Normally, cute is not a word I’d use for food, but these little birds truly are cute. I made mine Asian style and marinated them for about half hour before. The marinade is great, it has soy sauce, garlic and honey BBQ sauce, ginger, garlic, sesame oil, and white wine, it’s simply delicious. I also seared the birds first before roasting them, just to get a nice color on them and it was totally worth it. These quails were very tasty, the flavors totally worked together. Now after having said all these great things about quail, I have to tell you something. Quails are very small. As you can see in the picture I fitted 5 on that plate. So there’s not much to eat off them. The most meat is in the breast and a little on the drumsticks. But that’s about it, so if you think you can have one and be satisfied, not so much. I’d suggest at least 2 per serving. 3 if you want to be satisfied. However, they are totally worth trying, especially if you’ve never had them before. Have you had quail before, if so, how did you prepare them? I can think of a few different ways and I’d say grilled on a BBQ would be a great way to eat your quail as well. 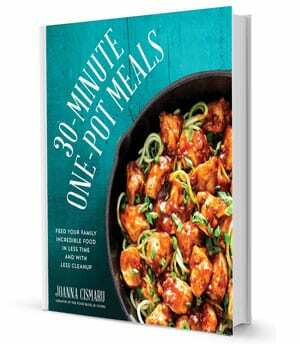 But if you do try them, try this Asian style recipe, you’ll like it. 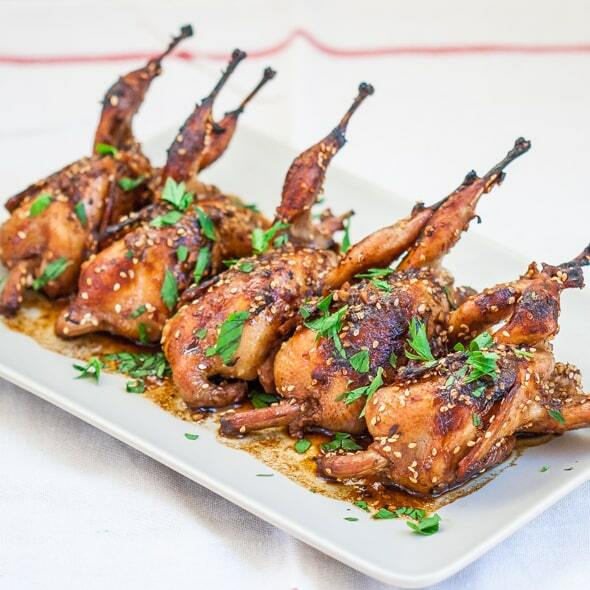 Asian Style Roasted Quail – these quails are full of flavor and spice, simply delicious. If you've never had quail before, then this recipe is a must. Combine all ingredients, excluding quail and vegetable oil, in large heavy-duty zip-top plastic bag and add quail. Seal, and chill 30 minutes, turning occasionally. In an oven proof large skillet or a dutch oven, heat the oil over medium to high heat. Sear the quail on all sides until brown, be careful to turn often, since quails are so small they might burn quickly. Save left over marinade. Roast quail in the oven uncovered for 20 to 30 minutes or until quail is done. In the meantime, pour the marinade in a small pot and simmer over medium heat for 10 minutes, it should reduce a bit. Pour marinade sauce over quail and serve hot with your favorite side dish. Made this today and we loved it! Definitely a favourite now…thanks for the recipe. I used my cast iron skillet for the browning on all 4 sides, then soaked my Romertopf Clay baker for 20 minutes and filled with just the pidgeons, covered, and baked at 400 degrees from a cold oven for 40 minutes. Then another 8 minutes without the top after pouring the simmered marinade over the top of the birds. I will definitely be making this again and again! I made a coconut, ginger jasmine rice and spooned some of the marinade over that too…perfect! Thank you for sharing your excellent recipe! Quick, easy and our kids loved it! Nothing more need be said. I served this with rice because the sauce is great over the rice. Of course this would probably be good on chicken or pork as well. Enjoy! Can you substitute white wine vinegar? For the wine? Yes, you can, perhaps I wouldn’t use quite as much though. I did substitute the white wine with white rice vinegar. I worked out perfectly. Basically it’s teriyaki quail. My wife is Chinese and I cooked this for her, we both thought it was very good. The teriyaki marinade is very versatile, I also used it with fish and veggies. Thank you Jo! So happy you guys liked it! How do you put your picture on here taking note that I use my phone. You could do the same dressing with chicken, right? What did the chicken do? Go eat grass if you can’t handle meat. All meat comes from death and one death isn’t more virtuous than the other. Seriously …. how much of a hypocrite are you? Only cute things are allowed to be considered spared by your resoning …. Panda’s and elephants over cows I guess then. 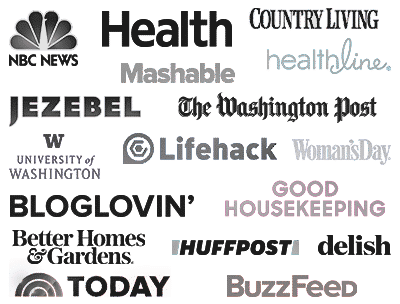 It’s folks like you that make comments saying “why don’t you get your meat from the store like regular folk” ….. have you tried marinated Tide pods …. amazingly yummy I hear.